Betta fish are beautiful and elegant pets. Often called Siamese fighting fish, Bettas are vibrant and can live from two to four years with the proper care. Halfmoon betta fish are among the prettiest tropical fish species, due to their 180-degree, fan-like tails. They are known for their brilliant colors—red, blue, green, purple, and orange—and large, flowing fins. Betta fish have been kept as pets in Thailand and Malaysia since before the 19th century. The males were bred to fight each other. 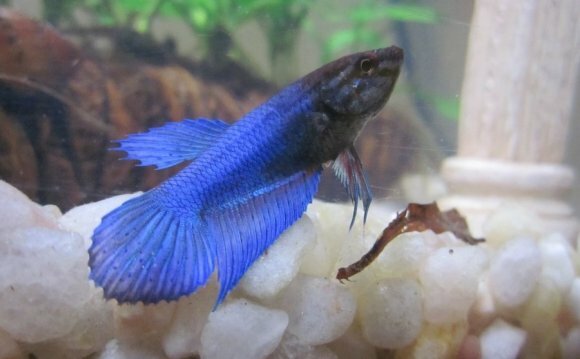 Naturally aggressive, pet betta fish fight longer and more ferociously than they would in the wild. Betta fish fights became popular in Thailand in the mid-1800s. By the 1890s it became common for Europeans to keep bettas as pets too and the species was imported to France, Germany, and then Moscow. It is incorrectly thought that bettas are low-maintenance pets. One reason is that they have what is called a labyrinth organ, that allows them to breathe air at the water's surface. It used to be thought that this trait meant the fish could live happily in an unmaintained aquaria. In fact, poor water quality will make any tropical fish, including betta, more susceptible to disease, including fin rot. Bettas are quite sensitive to habitat changes. You may be told that your betta will live happily in a small fishbowl. This is not true. Betta fish live longer, happier lives when they have ample space. Five gallon aquariums are best. Bettas can live with other fish, but a male should never live with another male, as they will fight one another.